Not to get religious..but your mom’s visit, flying home and contrail through the sun….sounds like the guy upstairs is pleases too. Just a thought. 5:46 am heading out on my short walk compaired to yours. See ya later..keep a step ahead of the other. God Bless and God Speed Mom. 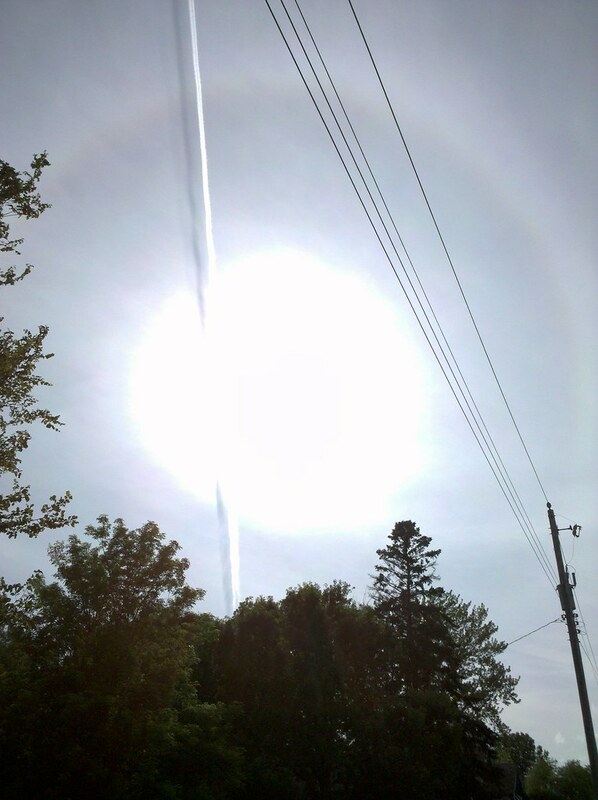 Contrail through the sun … doesn’t that mean six more weeks of Spring? WOW that is really cool!!! Very otherworldly. Check out the rainbow arc, too. Neat Sundog. But it usually means rain sometime in the next 36 hours. That would be a “chemtrail”, not a contrail. Especially if you believe in conspiracy theories. Hi, Matt: If you were driving, this really cool picture may have been missed. Love it!!! I have to agree with Ashley… that there is a chemtrail, not a contrail. There’s a big difference between the two. Watch out for Mulder and Scully, the Cigarett man, little green men and UFO’s !!!!!!!!!!!!!!!!!!! !